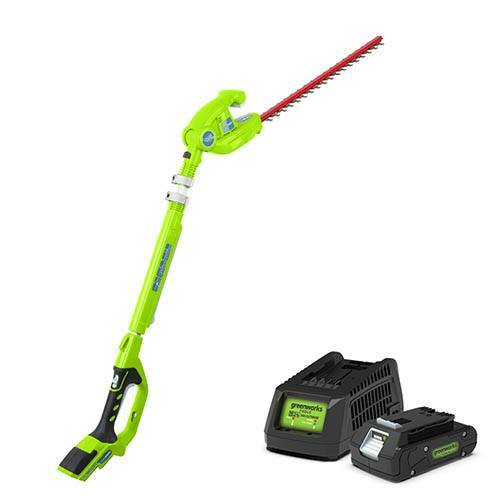 The Greenworks Long Reach Cordless Hedge Trimmer has 51cm dual action blades with an 18mm cutting capacity. The unit is powered by a 24 Volt high power rechargeable Lithium-ion battery. The extended shaft makes for increased reach and leverage during use, and the 7-position pivoting head provides trimming at multiple angles. This product is delivered directly from the supplier. An email address and telephone number must be given at the point of ordering so that delivery can be arranged.